Help us serve you within the prescribed timeframe. Make sure all of your files meet our technical print specifications. Refer to the documents and videos below to learn more about prepress and the print process. This document sets out the standards for: bleed, crop marks, finished size, safety margins, multi-version documents, rich black, colours (CMYK, RGB and Pantone), trapping, spines, total ink, overprint and knockout. U.S Web Coated (SWOP) v2 : For works printed on Gloss, Matte, semi-matte, semi-Gloss, Satin paper. U.S WEB Uncoated v2 : For works printed on offset, environ, SCA, SCB, Artisan paper. We will be happy to provide you with remote technical support. One of our technicians will connect directly to your computer to fix the problem or provide you with training. 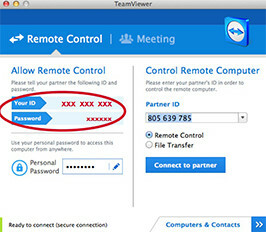 Simply download the TeamViewer application, and then send your 9-digit username and password to service.prepresse@solisco.com.